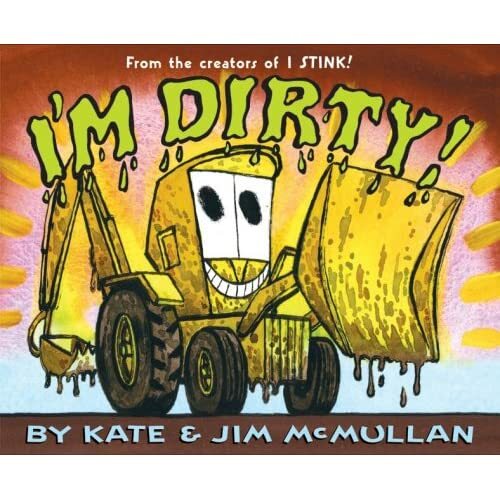 Kate and Jim McMullan’s picture books, I Stink! and I’m Dirty! are buckets of fun to read aloud to kids. They sound like “boy” books, don’t they? I’ll admit that my boys love them, but so do the girls. When I finished reading it aloud to the second graders for the first time, they immediately begged me to read it again. So, I decided to do I’m Dirty! as the library’s door decorations for our Read Across America celebration. I printed out the title and authors names, and drew a huge backhoe. The kids colored illustrations from the book that I found on Kate McMullan’s website. It was a blast. Hopefully, I’ll get some pictures posted of that soon.